Before :- Y.K. Sabharwal & Tarun Chatterjee, JJ. For the Appellant in C.A. Nos. 398-99 of 2001 :- Sanjay Parikh, Naveen R. Nath, Ms. Lalit Mohini Bhat, Ms. Anitha Shenoy, Ms. Hetu Arora and Sharan Dev Singh Thakur, Advocates. For the Appellant in C.A. Nos. 403-404 of 2001 :- K.K. Venugopal, Sr. Advocate and A.K. Sanghi, Advocate. For the Appellant in C.A. Nos. 461-462 of 2001 :- In-person (NP). For the Respondent :- Shiv Kumar Tiwari, Ms. Jaishree Tandon, Sakesh Kumar and Ms. Kamakshi S. Mehlwal, Advocates. A. Contempt of Courts Act, 1971, Sections 2(c), 11 and 12 - Contempt of Court - High Court acquitting the accused in a murder case - It was published in newspaper that decision of High Court was rubbish and one of the Judges was bribed and that Judge possessed properties disproportionate to his income - The news was published on basis of interview given by an associate of deceased to Correspondent of newspaper - High Court held the Editor, Printer, Publisher and Correspondent 'guilty' of Contempt - High Court did not accept their apology and sentenced each of them to undergo 6 months S.I. - The Contemners accepted their mistake and tendered unconditional apology - Conviction set aside with warning that in future they should be more careful and responsible in exercise of their duty towards the public, in providing fair, accurate and impartial information - In this view, sentence awarded to them is set aside. 1996(3) RCR(Crl.) 665 (SC) relied. B. Contempt of Courts Act, 1971, Sections 2(c), 11 and 12 - Contempt of Court - Judgments of courts are public documents and can be commented upon, analyzed and criticized, but it has to be in dignified manner without attributing motives - Before placing before public, whether on print or electronic media, all concerned have to see whether any such criticism has crossed the limits as aforesaid and if it has, then resist every temptation to make it public - In every case, it would be no answer to plead that publication, publisher, editor or other concerned did not know or it was done in haste - Large number of people believe as correct which appears in media, print or electronic - Media can, in the public interest, resort to reasonable criticism of a judicial act or the judgment of a court for public good or report any such statements; it should refrain from casting scurrilous aspersions on, or impute improper motives or personal bias to the Judge - Nor should they scandalize the court or the judiciary as a whole, or make personal allegations of lack of ability or integrity against a Judge. C. Contempt of Courts Act, 1971, Sections 2(c), 11 and 12 - Contempt of Court - Mens rea - Mens rea as such, is not an indispensable ingredient of the offence of contempt, the courts are loath to punish a contemnor, if the act or omission complained of, was not willful - Power and reach of the media, both print as well as electronic is tremendous - It has to be exercised in the interest of the public good. D. Contempt of Courts Act, 1971, Sections 2(c), 11 and 12 - Judgments of Court - Judgments are open to criticism - No criticism of a judgment, however vigorous, can amount to contempt of Court, provided it is kept within the limits of reasonable courtesy and good faith - Fair and reasonable criticism of a judgment which is a public document or which is a public act of a Judge concerned with administration of justice would not constitute contempt - Such a criticism may fairly assert that the judgment is incorrect or an error has been committed both with regard to law or established facts. E. Contempt of Courts Act, 1971, Sections 2(c), 11 and 12 - Contempt of Court - A question whether there is contempt of court or not is a serious one - The court is both the accuser as well as the Judge of the accusation - The court has to act with great circumspection - It is only when a clear case of contemptuous conduct not explainable otherwise, arises that the contemnor must be punished - Broad test to determine whether there is contempt of court or not, is to see whether the act complained of was calculated to obstruct or had an intrinsic tendency to interfere with the course of justice and the due administration of law - The standard of proof required for establishing a charge of 'criminal contempt' is the same as in any other criminal proceeding - Courts are loath to punish a contemnor, if the act or omission complained of, was not willful. Andre Paul Terence Ambard v. Attorney-General [AIR 1936 PC 141]. Aswini Kumar Ghose v. Arabinda Bose [AIR 1953 SC 75]. Brahma Prakash Sharma & Ors. v. State of U.P. [AIR 1954 SC 10]. Perspective Publications Pvt. Ltd. v. State of Maharashtra [AIR 1971 SC 221]. Shri C.K. Daphtary v. Shri O.P. Gupta [(1971)1 SCC 626]. R.C. Cooper v. Union of India [(1970)2 SCC 298]. In Re. S. Mulgaokar, [(1978)3 SCC 339]. P.N. Duda v. P. Shiv Shanker [(1988)3 SCC 167]. In Re. Roshan Lal Ahuja [1993 Supp. (4) SCC 446]. In Re. Ajay Kumar Pandey, 1998(4) ER 501 (SC) : [(1996)6 SCC 510]. Dr. D.C. Saxena v. Hon'ble Chief Justice of India [(1996)5 SCC 216]. J.R. Parashar, Advocate v. Prasant Bhushan, Advocate, 2001(4) RCR(Crl.) 171 (SC) : [(2001)6 SCC 735]. Re, Arundhati Roy, 2002(2) ER 70 (SC) : [(2002)3 SCC 343]. S. Abdul Karim v. M.K. Prakash [(1976)1 SCC 975]. M.R. Parashar v. Dr. Farooq Abdullah [(1984)2 SCC 343]. Mrityunjoy Das v. Sayed Hasibur Rahaman, 2001(2) RCR(Crl.) 260 (SC) : [(2001)3 SCC 739]. Bramblevale Ltd. Re [(1969)3 All ER 1062 (CA)]. Chhotu Ram v. Urvashi Gulati, 2002(1) RCR(Crl.) 179 (SC) : [(2001)7 SCC 530]. Anil Ratan Sarkar v Hirak Ghosh, 2002(4) RCR(Crl.) 517 (SC) : [(2002)4 SCC 21]. Radha Mohan Lal v. Rajasthan High Court (Jaipur Bench), 2003(2) RCR(Crl.) 46 (SC) : [(2003)3 SCC 427]. Bijay Kumar Mahanty v. Jadu alias Ram Chandra Sahoo, 2003(1) RCR(Crl.) 229 (SC) : [AIR 2003 SC 657]. Re Hari Jaisingh, 1996(3) ER 665 (SC) : [(1996)6 SCC 466]. Prem Surana v. Additional Munsif & Judicial Magistrate, 2002(4) RCR(Crl.) 272 (SC) : [(2002)6 SCC 722]. M.C. Mehta v. Union of India In Matter of : M/s. Ashok Chhabra & Co. [(2003)5 SCC 376]. Y.K. Sabharwal, J. - In the murder trial of Shankar Guha Niyogi, a trade union leader, the accused were found guilty and sentenced to imprisonment for life except one who was awarded death sentence. On appeal, the High Court reversed the trial court judgment and acquitted the accused. A news report was published in newspaper 'Hitavada' on 4th July, 1998 under the caption 'Sail terms High Court decision in Niyogi murder case as rubbish'. That report was based on the speech delivered by appellant Rajendra Sail in a rally organized to commemorate the death of Shankar Guha Niyogi and interview given by him soon after the speech to appellant Ravi Pandey, the correspondent of the newspaper. 2. The news report termed the decision as rubbish and commented that a Judge who was on verge of retirement should not have been entrusted with the responsibility of dealing with such a crucial case. It was also alleged that the Judges who decided the matter have belittled the respect for judiciary by pronouncing biased and rubbish judgment. The news report also quoted Rajendra Sail as saying that he was a key witness in the murder trial and in spite of engaging a well known advocate as public prosecutor no body could have made much difference when the Judges were already prejudiced and that he had substantial evidence to prove that one of the Judges who decided the matter was bribed and that the Judge possessed properties disproportionate to his income. 3. The aforesaid news item led to initiation of contempt action on an application filed by Madhya Pradesh High Court Bar Association with the consent of Advocate General against the Editor, Printer and Publisher, Chief Sub-Editor and Desk In-charge of the newspaper at Bhilai besides Burea Chief of 'Hitavada' at Bhilai. 4. In answer to contempt, while tendering unconditional and unqualified apologies, the stand of the Editor and Printer and Publisher of the newspaper before the High Court was that the news report was published on account of oversight and they were unaware of the publication. It was further stated that even before receipt of notice for contempt, on their own, they published unconditional apology in the newspaper on the front page on 6th August. 1998. The letters of apology were also sent to the Chief Justice and the concerned Judges of the High Court as well as to the Madhya Pradesh High Court Bar Association. The Chief Sub-Editor and Desk-in-charge took the stand that the news report was received from the trainee correspondent Ravi Pandey and he did not apply his mind seriously to the news report as the page on which the said report was to be printed was shown to him at the last stage of the printing deadline of that day and under these circumstances he permitted the page to be printed and published. 5. Appellant Ravi Pandey took the stand that at the relevant time he was working as a trainee correspondent and was present at the venue where Rajendra Sail delivered the speech and had a conversation with him in which he reiterated the substance of the speech delivered by him. He further pleaded that being a trainee correspondent he was unaware of the legal implications of printing and publishing against the judiciary and the Judges. He stood by his stand that the news report was based on the speech delivered and the subsequent conversation he had with Rajendra Sail. An unconditional and unqualified apology was also tendered by him. 6. Rajendra Sail denied that he gave any interview to the correspondent and alleged that the news report was false, prejudiced and intended to malign his image in the eyes of judiciary and public. It was further stated that he was not satisfied with the judgment of the High Court in Niyogi murder case and had only made a bonafide analysis of the judgment without bringing into disrepute the judiciary in general and the Judges in particular. It was claimed that he expressed only his personal grief and emotional trauma that arose out of the murder of Shankar Guha Niyogi, who was his close associate and that he was also a key prosecution witness in the murder trial. He further took the stand that he is ready to tender an apology, if his plea does not satisfy the court. (a) Judgment of the murderers of Niyogi was rendered within a year and the murderers have been acquitted because they were moneyed and wealthy people. (c) He would also get an enquiry held as regard to the conduct of one of the Judges who delivered the judgment, as that particular Judge is to retire within a month. (d) A Judge of High Court or Supreme Court who is about to retire should not be assigned any important case since two years before his retirement, as a Judge who is to retire is for sale. (e) Judiciary has no guts, no honesty and is not powerful enough to punish wealthy people. 8. After juxtaposing the news report with the audio and video recording as well as the transcript of the speech, the High Court found that there was 'inkling' in Rajendra Sail's speech about his thoughts regarding the judgment and the Judges. The court came to the conclusion that the attending circumstances i.e. the recordings of the speech as well as the transcript goes to show that he had conversation with the correspondent and the contemptuous statements reported in the news report were in fact uttered by him. The High Court also concluded that the comments made by him did not amount to fair and reasonable criticism of the judgment and that the contents of the news report scandalized the court. 9. The High Court, by the impugned judgment and order, refused to accept the apology tendered by the contemnors and held the appellants guilty of contempt of court and sentenced each of them to under go simple imprisonment for six months. 10. The principles relating to the law of contempt are well settled. 11. It has been repeatedly held that the rule of law is the foundation of the democratic society. The judiciary is the guardian of the rule of law. The confidence, which the people repose in the courts of justice, cannot be allowed to be tarnished, diminished or wiped out by contemptuous behaviour of any person. If the judiciary is to perform its duties and functions effectively and true to the spirit with which they are sacredly entrusted, the dignity and authority of the courts have to be respected and protected at all costs. The foundation of the judiciary is the trust and the confidence of the people in its ability to deliver fearless and impartial justice. When the foundation itself is shaken by acts which tend to create disaffection and disrespect for the authority of the court by creating distrust in its working, the edifice of the judicial system gets eroded. It is for this purpose that the courts are entrusted with extraordinary powers of punishing for contempt of court, those who indulge in acts, which tend to undermine the authority of law and bring it in disrepute and disrespect by scandalising it. When the court exercises this power, it does not do so to vindicate the dignity and honour of the individual Judge who is personally attacked or scandalised, but to uphold the majesty of the law and of the administration of justice. "No wrong is committed by any member of the public who exercises the ordinary right of criticising in good faith in private or public the public act done in the seat of justice. The path of criticism is a public way; the wrongheaded are permitted to err therein : provided that members of the public abstain from imputing improper motives to those taking part in the administration of justice, and are genuinely exercising a right of criticism and not acting in malice or attempting to impair the administration of justice, they are immune. Justice is not a cloistered virtue; she must be allowed to suffer the scrutiny and respectful even though outspoken comments of ordinary men". 13. In Aswini Kumar Ghose & Anr. v. Arabinda Bose & Anr. [AIR 1953 SC 75] it was held that the Supreme Court is never over-sensitive to public criticism; but when there is danger of grave mischief being done in the matter of administration of justice, the animadversion cannot be ignored and viewed with placid equanimity. The path of criticism is a public way: the wrong-headed are permitted to err therein; provided that members of the public abstain from imputing improper motives to those taking part in the administration of justice, and are genuinely exercising a right of criticism and not acting in malice or attempting to impair the administration of justice, they are immune. Justice is not a cloistered virtue; she must be allowed to suffer the scrutiny and respectful even though outspoken comments of ordinary men. 14. In Brahma Prakash Sharma & Ors. v. The State of U.P. [AIR 1954 SC 10] it was held that, if the publication of the disparaging statement is calculated to interfere with the due course of justice or proper administration of law by such court, it can be punished summarily as contempt is a wrong done to the public. It will be injury to the public if it tends to create an apprehension in the minds of the people regarding the integrity, ability or fairness of the Judge or to deter actual and prospective litigants from placing complete reliance upon the court's administration of justice, or if it is likely to cause embarrassment in the mind of the Judge himself in the discharge of his judicial duties. It is well established that it is not necessary to prove affirmatively that there has been an actual interference with the administration of justice by reason of such defamatory statement; it is enough if it is likely, or tends in any way, to interfere with the proper administration of law. "(1) The summary jurisdiction by way of contempt must be exercised with great care and caution and only when its exercise is necessary for the proper administration of law and justice. (2) It is open to anyone to express fair, reasonable and legitimate criticism of any act or conduct of a Judge in his judicial capacity or even to make a proper and fair comment on any decision given by him because "justice is not a cloistered virtue and she must be allowed to suffer the scrutiny and respectful, even though outspoken, comments of ordinary men". (3) A distinction must be made between a mere libel of defamation of a Judge and what amounts to a contempt of the court. The test in each case would be whether the impugned publication is a mere defamatory attack on the Judge or whether it is calculated to interfere with the due course of justice or the proper administration of law by his court. It is only in the latter case that it will be punishable as contempt. Alternatively the test will be whether the wrong is done to the Judge personally or it is done to the public. The publication of a disparaging statement will be an injury to the public if it tends to create an apprehension in the minds of the people regarding the integrity, ability or fairness of the Judge or to deter actual and prospective litigants from placing complete reliance upon the court's administration of justice or if it is likely to cause embarrassment in the mind of the Judge himself in the discharge of his judicial duties." 16. In Shri C.K. Daphtary & Ors. v. Shri O.P. Gupta & Ors. [(1971)1 SCC 626] it was said that, a scurrilous attack on a Judge in respect of a judgment or past conduct has adverse effect on the due administration of justice. This sort of attack in a country like ours has the inevitable effect of undermining the confidence of the public in the Judiciary. If confidence in the Judiciary goes, the due administration of justice definitely suffers. There can be no justification of contempt of Court. "There is no doubt that the Court like any other institution does not enjoy immunity from fair criticism. This Court does not claim to be always right although it does not spare any effort to be right according to the best of the ability, knowledge and judgment of the Judges. They do not think themselves in possession of all truth or hold that whenever others differ from them, it is so far error. No one is more conscious of his limitations and fallibility than a Judge but because of his training and the assistance he gets from learned counsel he is apt to avoid mistakes more than others..... We are constrained to say also that while fair and temperate criticism of this Court or any other Court even if strong, may not be actionable, attributing improper motives, or tending to bring Judges or Courts into hatred and contempt or obstructing directly or indirectly with the functioning of Courts is serious contempt of which notice must and will be taken. Respect is expected not only from those to whom the judgment of the Court is acceptable but also from those to whom it is repugnant. Those who err in their criticism by indulging in vilification of the institution of Courts, administration of justice and the instruments through which the administration acts, should take heed for they will act at their own peril. We think this will be enough caution to persons embarking on the path of criticism." 17. In In re. S. Mulgaokar, [(1978)3 SCC 339] a three-Judge Bench held, the judiciary is not immune from criticism but when that criticism is based on obvious distortion or gross misstatement and made in a manner which is designed to lower the respect of the judiciary and destroy public confidence in it, it cannot be ignored. 18. In P.N. Duda v. P. Shiv Shanker & Ors. [(1988)3 SCC 167] it has been held that administration of justice and Judges are open to public criticism and public scrutiny. Judges have their accountability to the society and their accountability must be judged by the conscience and oath to their office i.e. to defend and uphold the Constitution and the laws without fear and favour. Any criticism about the judicial system or the Judges which hampers the administration of justice or which erodes the faith in the objective approach of the Judges and brings administration of justice to ridicule must be prevented. The contempt of court proceedings arise out of that attempt. Judgments can be criticized, motives to the Judges need not be attributed, it brings the administration of justice into deep disrepute. Faith in the administration of justice is one of the pillars on which democratic institution functions and sustains. In the free market place of ideas criticism about the judicial system or Judges should be welcome so long as such criticism does not impair or hamper the administration of justice. In a democracy Judges and courts alike are, therefore, subject to criticism and if reasonable argument or criticism in respectful language and tempered with moderation is offered against any judicial act as contrary to law or public good, no court would treat criticism as a contempt of court. 19. In Re. Roshan Lal Ahuja [1993 Supp. (4) SCC 446], a three-Judge Bench held, Judgments of the court are open to criticism. Judges and courts are not unduly sensitive or touchy to fair and reasonable criticism of their judgments. Fair comments, even if, outspoken, but made without any malice or attempting to impair the administration of justice and made in good faith in proper language don't attract any punishment for contempt of court. However, when from the criticism a deliberate, motivated and calculated attempt is discernible to bring down the image of the judiciary in the estimation of the public or to impair the administration of justice or tend to bring the administration of justice into disrepute the courts must bester themselves to uphold their dignity and the majesty of law. No litigant can be permitted to overstep the limits of fair, bonafide and reasonable criticism of a judgment and bring the courts generally in disrepute or attribute motives to the Judges rendering the judgment. Perversity, calculated to undermine the judicial system and the prestige of the court, cannot be permitted for otherwise the very foundation of the judicial system is bound to be undermined and weakened and that would be bad not only for the preservation of rule of law but also for the independence of judiciary. Liberty of free expression is not to be confused with a licence to make unfounded, unwarranted and irresponsible aspersions against the Judges or the courts in relation to judicial matters. No system of justice can tolerate such an unbridled licence. Of course "Justice is not a cloistered virtue; she must be allowed to suffer the scrutiny and respectful, even though outspoken, comments of ordinary men", but the members of the public have to abstain from imputing improper motives to those taking part in the administration of justice and exercise their right of free criticism without malice or in any way attempting to impair to administration of justice and refrain from making any comment which tends to scandalize the court in relation to judicial matters. If a person committing such gross contempt of court were to get the impression that he will get off lightly it would be a most unfortunate state of affairs. Sympathy in such a case would be totally misplaced mercy has no meaning. His action calls for deterrent punishment to that it also serves as an example to others and there is no repetition of such contempt by any other person. 20. In Re. Ajay Kumar Pandey, 1998(4) ER 501 (SC) : [(1996)6 SCC 510], it has been held, any threat of filing a complaint against the Judge in respect of the judicial proceedings conducted by him in his own Court is a positive attempt to interfere with the due course of administration of justice. In order that the Judges may fearlessly and independently act in the discharge of their judicial functions, it is necessary that they should have full liberty to act within the sphere of their activity. If, however, litigants and their counsel start threatening the Judge or launch prosecution against him for what he has honestly and bonafide done in his Court, the judicial independence would vanish eroding the very edifice on which the institution of justice stands. "Scandalising the court, therefore, would mean hostile criticism of Judges as Judges or judiciary. Any personal attack upon a Judge in connection with the office he holds is dealt with under law of libel or slander. Yet defamatory publication concerning the Judge as a Judge brings the court or Judges into contempt, a serious impediment to justice and an inroad on the majesty of justice. Any caricature of a Judge calculated to lower the dignity of the court would destroy, undermine or tend to undermine public confidence in the administration of justice or the majesty of justice. It would, therefore, be scandalising the Judge as a Judge, in other words, imputing partiality, corruption, bias, improper motives to a Judge is scandalisation of the court and would be contempt of the court. Even imputation of lack of impartiality or fairness to a Judge in the discharge of his official duties amounts to contempt. The gravamen of the offence is that of lowering his dignity or authority or an affront to the majesty of justice. When the contemnor challenges the authority of the court, he interferes with the performance of duties of Judge's office or judicial process or administration of justice or generation or production of tendency bringing the Judge or judiciary into contempt. Section 2(c) of the Act, therefore, defines criminal contempt in wider articulation that any publication, whether by words, spoken or written, or by signs, or by visible representations, or otherwise of any matter or the doing of any other act whatsoever which scandalises or tends to scandalise, or lowers or tends to lower the authority of any court; or prejudices, or interferes or tends to interfere with, the due course of any judicial proceeding; or interferes or tends to interfere with, or obstructs or tends to obstruct, the administration of justice in any other manner, is a criminal contempt. Therefore, a tendency to scandalise the court or tendency to lower the authority of the court or tendency to interfere with or tendency to obstruct the administration of justice in any manner or tendency to challenge the authority or majesty of justice, would be a criminal contempt. The offending act apart, any tendency if it may lead to or tends to lower the authority of the court is a criminal contempt. Any conduct of the contemnor which has the tendency or produces a tendency to bring the Judge or court into contempt or tends to lower the authority of the court would also be contempt of the court." "To ascribe motives to a Judge is to sow the seed of distrust in the minds of the public about the administration of justice as a whole and nothing is more pernicious in its consequences than to prejudice the mind of the public against Judges of the court who are responsible for implementing the law. Judges do not defend their decisions in public and if citizens disrespect the persons laying down the law, they cannot be expected to respect the law laid down by them. The only way the Judge can defend a decision is by the reasoning in the decision itself and it is certainly open to being criticized by anyone who thinks that it is erroneous". 23. In re, Arundhati Roy, 2002(2) RCR(Crl.) 70 (SC) : [(2002)3 SCC 343] the court held, fair criticism of the conduct of a Judge, the institution of the judiciary and its functioning may not amount to contempt if it is made in good faith and in public interest. To ascertain the good faith and the public interest, the courts have to see all the surrounding circumstances including the person responsible for comments, his knowledge in the field regarding which the comments are made and the intended purpose sought to be achieved. All citizens cannot be permitted to comment upon the conduct of the courts in the name of fair criticism which, if not checked, would destroy the institution itself. Litigant losing in the court would be the first to impute motives to the Judges and the institution in the name of fair criticism, which cannot be allowed for preserving the public faith in an important pillar of democratic set-up i.e. judiciary. 24. A question whether there is contempt of court or not is a serious one. The court is both the accuser as well as the judge of the accusation. The court has to act with a great circumspection. It is only when a clear case of contemptuous conduct not explainable otherwise, arises that the contemnor must be punished. 25. In S. Abdul Karim, Appellant v. M.K. Prakash & Ors. [(1976)1 SCC 975] a three-Judge Bench held, the broad test to determine whether there is contempt of court or not, is to see whether the act complained of was calculated to obstruct or had an intrinsic tendency to interfere with the course of justice and the due administration of law. 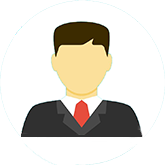 The standard of proof required for establishing a charge of 'criminal contempt' is the same as in any other criminal proceeding. Even if it could be urged that mens rea as such, is not an indispensable ingredient of the offence of contempt, the courts are loath to punish a contemnor, if the act or omission complained of, was not willful. 26. In M.R. Parashar & Ors. v. Dr. Farooq Abdullah & Ors. [(1984)2 SCC 343] contempt petition was filed against the Chief Minister of Jammu and Kashmir for making certain contemptuous statements against the judiciary and the Editor and the correspondent of a newspaper in which those statements were published. The Chief Minister denied to have made the statements, as the Editor asserted that the reports of the speeches published in his newspaper are true. The court held that in the absence of any preponderant circumstances which, objectively, compel the acceptance of the word of one in preference to the word of the other, it was unable to record a positive finding that the allegation that the Chief Minister made the particular statements is proved beyond a reasonable doubt. "A contempt of court is an offence of a criminal character. A man may be sent to prison for it. It must be satisfactorily proved. To use the time-honoured phrase, it must be proved beyond reasonable doubt. It is not proved by showing that, when the man was asked about it, he told lies. There must be some further evidence to incriminate him. Once some evidence is given, then his lies can be thrown into the scale against him. But there must be some other evidence.... Where there are two equally consistent possibilities open to the court, it is not right to hold that the offence is proved beyond reasonable doubt." 28. This legal position has been reiterated in the subsequent line of cases namely, Chhotu Ram v. Urvashi Gulati & Anr., 2002(1) RCR(Crl.) 179 (SC) : [(2001)7 SCC 530]; Anil Ratan Sarkar v Hirak Ghosh, 2002(4) RCR(Crl.) 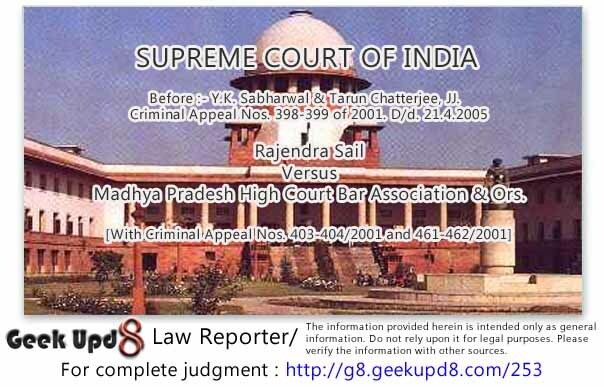 517 (SC) : [(2002)4 SCC 21]; Radha Mohan Lal v. Rajasthan High Court (Jaipur Bench), 2003(2) RCR(Crl.) 46 (SC) : [(2003)3 SCC 427]; Bijay Kumar Mahanty v. Jadu alias Ram Chandra Sahoo, 2003(1) RCR(Crl.) 229 (SC) : [AIR 2003 SC 657]. 29. With this factual and legal background, we would consider the submissions made in support of these appeals. 30. The learned counsel appearing for the editor, printer and publisher and the Chief sub-editor has very candidly not made any attempt to justify the actions of the newspaper in publishing the news report. Learned counsel has only argued for acceptance of the apology. Learned counsel submits that the appellants tendered apology on 6th August, 1998 by publishing it prominently in the front page of Hitavada, even before the receipt of notice of initiation of contempt action. It was pointed out that the notice of contempt though issued on 13th June, 1998 was received only on 11th August, 1998. The letters of apology were sent to the Chief Justice of the High Court and to the concerned Judges as well as to the Madhya Pradesh High Court Bar Association before receipt of contempt notice. The counsel further submits that the act of newspaper functionaries of having immediately tendered the apology admitting their mistake shows that there was no intention to scandalise the judiciary but it was case of genuine error on their part. 31. The reach of media, in present times of 24 hours channels, is to almost every nook and corner of the world. Further, large number of people believe as correct which appears in media, print or electronic. It is also necessary to always bear in mind that the judiciary is the last resort of redressal for resolution of disputes between State and subject, and high and law. The confidence of people in the institute of judiciary is necessary to be preserved at any cost. That is its main asset. Loss of confidence in institution of judiciary would be end of Rule of law. Therefore, any act which has such tendency deserves to be firmly curbed. For rule of law and orderly society, a free responsible press and independent judiciary are both indispensable. Both have to be, therefore, protected. 32. The judgments of courts are public documents and can be commented upon, analyzed and criticized, but it has to be in dignified manner without attributing motives. Before placing before public, whether on print or electronic media, all concerned have to see whether any such criticism has crossed the limits as aforesaid and if it has, then resist every temptation to make it public. In every case, it would be no answer to plead that publication, publisher, editor or other concerned did not know or it was done in haste. Some mechanism may have to be devised to check the publication which has the tendency to undermine the institution of judiciary. 33. Regarding the general mechanism to be devised, it may be noted that in United Kingdom, Robertson & Nicol on Media Law expresses the view that media's self-regulation has failed in United Kingdom. According to the author, blatant examples of unfair and unethical media behaviour like damaging reputation by publishing falsehoods, invasion of privacy and conducting partisan campaigns towards individuals and organisations have led to demands for more statutory controls, which media industries have sought to avoid by trumpeting the virtues of "self-regulation". The media industry has established tribunals that affect to regulate media ethics through adjudicating complaints by members of the public who claim to have been unfairly treated by journalists and editors. Complaints about newspapers and journals may be made to the Press Complaints Commission, a private body funded by newspaper proprietors. The Press Complaints Commission has formulated a Code of Practice to be followed by the press. It has no legal powers, but its adjudications will be published by the paper complained against, albeit usually in small print and without prominence. The Press Complaints Commission has been regarded as public relations operation, funded by media industries to give the impression to Parliament that the media organizations can really put their houses in ethical order without the need for legislation. Similarly the National Union of Journalists has a code for its members, which they are all expected to follow. However, the code is seldom enforced. 34. Having noted the views as aforesaid, in the present case, it is enough to only note that we too have Press Council. The only aspect, we wish to emphasis is that the present matter reinforces the need to ensure that the right of freedom of media is exercised responsibly. It is for media itself and other concerned to consider as how to achieve it. 35. Regarding the institution like judiciary which cannot go public, media can consider having an internal mechanism to prevent these types of publications. There can be an efficient and stringent mechanism to scrutinize the news reports pertaining to such institutions which because of the nature of their office cannot reply to publications which have tendency to bring disrespect and disrepute to those institutions. As already noted such publications are likely to be believed as true. Such a mechanism can be the answer to pleas like the one in the present case by Editor, Printer and Publisher and correspondent that either they did not know or it was done in a hurry and similar pleas and defences. 36. The power and reach of the media, both print as well as electronic is tremendous. It has to be exercised in the interest of the public good. A free press is one of very important pillar on which the foundation of Rule of Law and democracy rests. At the same time, it is also necessary that freedom must be exercised with utmost responsibility. It must not be abused. It should not be treated as a licence to denigrate other institutions. Sensationalism is not unknown. Any attempt to make news out of nothing just for the sake of sensitization has to be deprecated. When there is temptation to sensationalize particularly at the expense of those institutions or persons who form the nature of the office cannot reply, such temptation has to be resisted and if not it would be the task of the law to give clear guidance as to what is and what is not permitted. 37. While the media can, in the public interest, resort to reasonable criticism of a judicial act or the judgment of a court for public good or report any such statements; it should refrain from casting scurrilous aspersions on, or impute improper motives or personal bias to the Judge. Nor should they scandalize the court or the judiciary as a whole, or make personal allegations of lack of ability or integrity against a Judge. It should be kept in mind that Judges do not defend their decisions in public and if citizens disrespect the persons laying down the law, they cannot be expected to respect the law laid down by them. The only way the Judge can defend a decision is by the reasoning in the decision itself and it is certainly open to being criticized by anyone who thinks that it is erroneous. 38. This court on an earlier occasion in Re Hari Jaisingh & Anr., 1996(3) RCR(Crl.) 665 (SC) : [(1996)6 SCC 466] held the Editor, Printer and Publisher and Reporter guilty of publishing a false report against a senior Judge of the Supreme Court. The Court expressed its displeasure at the irresponsible conduct and attitude on the part of the editor, publisher and the reporter who failed to make reasonable enquiry or a simple verification of the alleged statement. The Court held that this cannot be regarded as a public service, but a disservice to the public by misguiding them with false news. However, the Court accepted the unconditional apology tendered by the editor, printer and publisher and reporter with a warning that they should be careful in future. 39. Reverting to the present case, we have noted hereinbefore the stand of Editor, Printer and Publisher and Chief Sub-editor including the fact that they had accepted their mistakes at the earliest and tendered unconditional apologies, Reporter has also tendered his unconditional apology pleading that as a trainee, he was not aware of the legal implications. Having regard to the facts and legal principles above noticed, their apologies deserve to be accepted with a caution that in future they should be more careful and responsible in exercise of their duty towards the public, in providing fair, accurate and impartial information. In this view, sentence awarded to them is set aside. 40. Learned counsel appearing for the appellant, Rajendra Sail also submits that the apology tendered by his client too deserves to be accepted. He submits that the statements made by Rajendra Sail should be understood in the context in which the same were made. The context pointed out is that Rajendra Sail was a close associate of Mr. Shankar Guha Niyogi, who was murdered and he was a key prosecution witness in the murder trial; he was emotionally disturbed because of the judgment of the High Court; the news report was intended to malign his image and he had lodged a complaint against this with the Press Council of India. Learned counsel further submits that Rajendra Sail neither made statements nor gave interview attributed to him and that the conclusions reached by the High Court that he did not deny having termed the decision of the High Court as rubbish is not sustainable. Learned counsel further contends that the charge that was communicated to the appellant was only about the contents of the news report and the contemptuous statements extracted in the judgment of the High Court were not part of the news report. The audio and video recordings on which conclusions of the High Court are based were never put to him, the same were not part of the record and no opportunity was granted to rebut the contents of the audio and video recording and, therefore, the contents thereof cannot be taken as proof of the statements contained in the news report. The appellant tendered an unconditional apology during the course of the arguments and urged for its acceptance. 41. The counsel appearing for the Madhya Pradesh High Court Bar Association, supporting the impugned judgment, submits that having regard to the nature of scandalous statements that were made, it is not a case where the apology should be accepted. In support of his contention he relied on the following decisions, Prem Surana v. Additional Munsif & Judicial Magistrate & Anr., 2002(4) RCR(Crl.) 272 (SC) : [(2002)6 SCC 722]; M.C. Mehta v. Union of India & Ors. In The Matter of : M/s. Ashok Chhabra & Co. [(2003)5 SCC 376]. 42. The issue as to whether the alleged statements amount to contempt or not does not present any difficulty in the present case. If the conclusions reached by the High Court are correct, there can be little doubt that it is serious case of scandalizing the Court and not a case of fair criticism of a judgment. Undoubtedly, judgments are open to criticism. No criticism of a judgment, however vigorous, can amount to contempt of Court, provided it is kept within the limits of reasonable courtesy and good faith. Fair and reasonable criticism of a judgment which is a public document or which is a public act of a Judge concerned with administration of justice would not constitute contempt. Such a criticism may fairly assert that the judgment is incorrect or an error has been committed both with regard to law or established facts. 43. It is one thing to say that a judgment on facts as disclosed is not in consonance with evidence or the law has not been correctly applied. But when it is said that the Judge had a pre-disposition to acquit the accused because he had already resolved to acquit them or has a bias or has been bribed or attributing such motives, lack of dispassionate and objective approach and analysis and prejudging of the issues, the comments that a Judge about to retire is available for sale, that an enquiry will be conducted as regards the conduct of the Judge who delivered the judgment as he is to retire within a month and a wild allegation that judiciary has no guts, no honesty and is not powerful enough to punish wealthy people would bring administration of justice into ridicule and disrepute. The speech that judgment is rubbish and deserves to be thrown in a dustbin cannot be said to be a fair criticism of judgment. These comments have transgressed the limits of fair and bonafide criticism and have a clear tendency to affect the dignity and prestige of the judiciary. It has a tendency to create an apprehension in the minds of the people regarding the integrity, ability or fairness of the Judge and to deter actual and prospective litigants from placing complete reliance upon the court's administration of justice, it is also likely to cause embarrassment in the mind of the Judge himself in the discharge of his judicial duties. 44. When there is danger of grave mischief being done in the matter of administration of justice, the animadversion cannot be ignored and viewed with placid equanimity. If the criticism is likely to interfere with due administration of justice or undermine the confidence which the public reposes in the Courts of law as Courts of justice, the criticism would cease to be fair and reasonable criticism but would scandalise Courts and substantially interfere with administration of justice. Having perused the record, we are unable to accept the contention urged on behalf of Mr. Rajendra Sail that on facts the conclusions arrived at by the High Court are not sustainable. Once this conclusion is reached, clearly the publication amounts to a gross contempt of court. It has serious tendency to undermine the confidence of the society in the administration. 45. The news report was based on the speech delivered by Rajendra Sail and the subsequent interview given to the correspondent. The correspondent has asserted that the news report was based on the speech delivered by Rajendra Sail and the subsequent interview. Rajendra Sail has, however, denied having made the statement or having given interview to the correspondent. There are preponderant circumstances, which objectively compel us to conclude that the said statements were in fact made by Rajendra Sail and the news report has reported the same. Whether Rajendra Sail gave interview to the correspondent or not, the speech itself, seen in the light of the audio and video recording of the speech and the transcript of the speech speaks for itself and has the effect of lowering the dignity and authority of the court and an affront to the majesty of justice. 46. The contention that no opportunity was given to rebut the contents of the audio and video recording of the speech cannot be accepted because the court has, in fact, directed supply of copies of transcript of the speech prepared from the audio and video recording and had given opportunity to file objections to it, which has not been availed by Rajendra Sail. 47. Having regard to the aforesaid facts of the case, the High Court has refused to accept the apology tendered by Rajendra Sail. The contention that statements should be understood in the context in which they have been made as he was emotionally disturbed because of the judgment of the High court cannot be accepted. It is borne out from record that Rajendra Sail is a law graduate and has been in public life for considerable time and has in fact approached the court on several occasions by filing public interest litigations in different matters. With this background, he should have been cautious and moderate and should have known the limits upto which he could go while criticizing the judgment of the High Court. The contemptuous statements cannot be regarded as an ill-tempered or emotional outburst of an uninformed person. Having given the serious and anxious consideration to the facts of the case and submissions made, we feel that the acceptance of apology and sympathy in a case like this would be uncalled for. 48. The sentence awarded to Rajendra Sail by the High Court having regard to nature of contempt cannot be said to be unjustified. But having regard to his background and the organization to which he belongs which, it is claimed, brought before various courts including this court many public interest litigation for general public good, we feel that ends of justice would be met if sentence of six month is reduced to sentence of one week simple imprisonment. We order accordingly. 49. In view of the above, sentence awarded to the appellants other than Rajendra Sail is set aside and their apologies accepted and their appeals allowed accordingly. The sentence of Rajendra Sail is reduced to one week and to that extent impugned judgment and order of the High Court is modified and appeal disposed of accordingly.